Softness and flexibility are key properties for medical devices. This is, for example, crucial for tubing that goes inside the body, which must be as soft as possible for optimum patient treatment and comfort. In order to make PVC medical devices soft and flexible, a plasticiser (US: plasticizer) is added to the PVC compound. A wide range of plasticisers for medical applications are now included in the European Pharmacopoeia, which sets Europe’s legal and scientific standards to delivering high quality medicines in Europe and beyond. This broad range of plasticisers allows medical devices manufacturers to develop high performance medical PVC solutions to best serve patients and medical professionals. Watch the video below to learn more about the regulatory situation for plasticisers in medical applications in the EU. The phthalate DEHP used to be the main plasticizer in medical PVC due to its technical properties and low cost. The substance has been under increasing scrutiny by regulatory and medical authorities, and in the EU its continued use in medical devices after 2020 will require robust justification. The PVCMed Alliance is committed to proactively contribute to this scientific process, always providing the best solutions to medical professionals contributing to affordable quality healthcare for all. 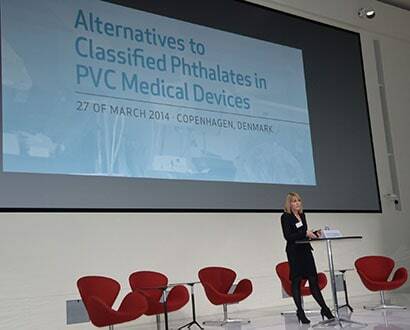 We have contributed to the Danish Environmental Protection Agency's 2014 report on alternatives to DEHP and classified phthalates in medical devices, which identified ten potential alternative plasticisers already in use. Following the report, PVCMed Alliance co-organised an international conference in Copenhagen in 2014 with attendance from a broad range of stakeholders. The Alliance is planning to continue to contribute in the future.